Used in all top 200 universities worldwide, the latest Wolfram tools now also cover high school. Bring a subject to life with compelling on-the-fly visualizations backed by powerful student-accessible computation and data capabilities. Create lesson plans that mix text, graphics, code, and more. Let your students self-test with automatic problem generation—and get tutor-quality step-by-step solutions. And use the breakthrough Wolfram Language to introduce students to the power of modern computation—and enable a new generation of student projects and achievement. The Wolfram Technology System for High Schools is an all-in-one solution—easy to use, convenient to deploy. Instant computation and fact finding across the curriculum—including Step-by-step solutions, self-testing problems, and more. Access Mathematica through the web—directly or through a course management system. Mix text, graphics, computation, and interactive demonstrations for presentations, assignments, lesson plans, and self-paced student work. Introduce programming and the concepts of computation—and immediately connect across the curriculum—with the breakthrough Wolfram Language. In all cases, files can automatically be shared through the Wolfram Cloud. Wolfram technologies provide an integrated approach to computation across the curriculum. Let your students create cutting-edge interactive visual art, algorithmic music, and 3D printouts—learning geometric layout and modeling, image manipulation, color theory, and music theory—as well as computer skills. Give your students instant access to a wealth of real-world financial and other data—and illustrate business concepts with compelling interactive models and visualizations, reinforcing quantitative and computing skills. 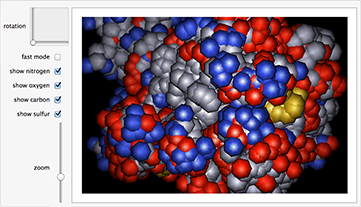 With vast built-in chemical databases, instantly visualize 3D molecular structures—and generate automatic step-by-step solutions to chemistry problems and analyze experimental measurements. Weather, earthquakes, minerals, astronomy, geography: Wolfram tools give you deep and up-to-the-minute data—connected to instant compelling visualizations. Teach with compelling interactive visualizations that can use both idealized and real physics—and get instant access to real-world data as well as analyzing and graphing directly from lab equipment, cameras, etc. Give your students an immediate way to analyze and visualize data—and illustrate the principles of statistics with interactive demonstrations, exact algebraic results, and built-in access to real data from thousands of domains. Introduce programming in a uniquely easy and compelling way with the breakthrough Wolfram Language—with instant visualizations and built-in real-world data—and make connections across the curriculum. Use a wealth of real-world data to demonstrate principles of economics, with instant interactive modeling and visualizations—and let students do their own cutting-edge economic simulations. Teach math the Wolfram way—with powerful interactive visualizations, real math notation, and now step-by-step solutions and automatic problem generation—as well as instant access to a host of engaging real-world data. Expose your students to a wealth of real-world social, cultural, and geographic data with instant interactive infographics, mapping, and analysis—integrating quantitative and computer skills into social science teaching. From math and science to social studies and music, the Wolfram Technology System helps students grasp difficult-to-understand concepts better than a static textbook, offering interactive visualizations, homework solvers, and tools to learn how to program. Used throughout the technical and educational communities, Wolfram technologies give students a jump-start as they enter college with skills they'll use throughout their academic and professional careers. Wolfram technologies are easy to use and interactive, allowing you to create visualizations on-the-fly during class based on student questions. Outside of class, students can use Wolfram technologies to further explore these concepts, eliminating the need to re-explain these concepts the following day. A single document created with Wolfram technologies can combine your class notes, interactive examples, and student projects. And when you're ready to test students on what they've learned, create a set of quiz problems with an answer sheet or assign students practice problems, including step-by-step hints. Wolfram technologies are consistent as hardware evolves, saving faculty time by eliminating updates to course lessons with newer computer labs or operating systems. Many materials are maintained on Wolfram's servers to provide consistent access with no administration time. With natural language understanding, using the Wolfram Technology System is as easy as typing what you want it to do. No documentation needed. And with close to 10,000 interactive visualizations available for free download, you can start using pre-made examples in your own classes immediately. Whether you choose to make the Wolfram Technology System available to students via computer labs, classroom carts, tablets, mobile devices, personal laptops, or cloud accounts that eliminate installation and IT administration time altogether, students can share files across a variety of devices. Rather than purchasing specialized software that can only be used by one teacher or one course, Wolfram technologies can be used in a variety of STEM and non-STEM classes, saving your school money. Consolidate individual purchases by students and teachers with the Wolfram Technology System to make access uniform for all students and teachers. Wolfram technologies are the standard in higher education, a wide range of areas in industry, and in government labs. This means that when you adopt the Wolfram Technology System, you're able to collaborate with neighboring colleges and companies who use Wolfram technologies and ensure that matriculating students have a competitive edge. Teachers across multiple departments and schools can use the Wolfram Technology System to collaborate and share their ideas, refining course content and introducing new approaches that raise education to a whole new level. 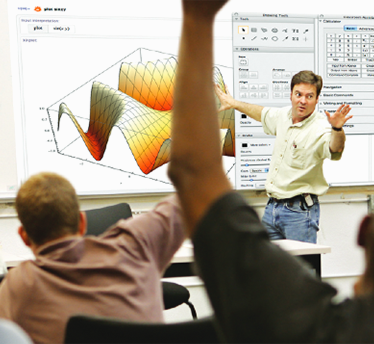 Linked to many major teaching awards, the Wolfram Technology System supports nontraditional learning styles and approaches, allowing innovative faculty to explore concepts using a multi-directional approach so that all students have a solid understanding as they progress from one topic to the next.